I got one almost as soon as it was out. I knew this was the device I have looked for, for a long time and for several reasons. I spend a good chunk of my day reading, and you’re more comfortable reading on the sofa that in your office chair. I haven’t had the slightest regret since I purchased it. It changed a lot of my workflow, for the better. I went a long way toward a paperless office and workflow. A few quick thoughts on the device. The form factor is excellent. Smaller would be uncomfortable, in particular for reading papers. A larger screen would make reading papers more comfortable, obviously. The weight is ok. The Apple case is poor, but you need a case. Battery life is amazing, I can use it a couple of days in a row without recharging it. I went for the 16Gb Wifi (there is always wifi at hotels and conferences), since I am only storing papers and misc docs on the iPad. Almost no music or pictures, so 16Gb are more than enough (my whole papers library is around 1Gb). Reading in daylight is ok, contrary to what others said, just increase the brightness of the screen. Here is a rundown of the apps I am using regularly so far, or that I tried. 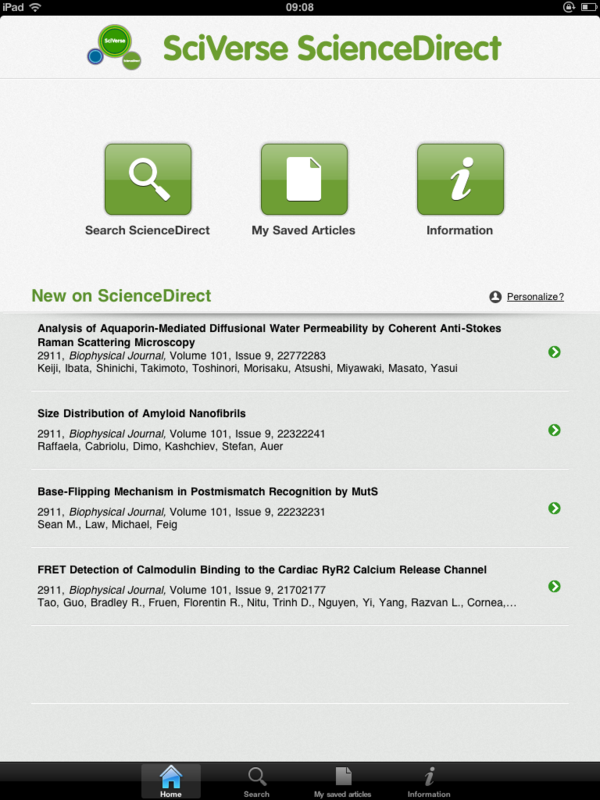 A fairly exhaustive list of app for scientist can be found here. Kindle and IBooks. For books. Not for PDF (for me), see below. Free. Pulse. Excellent for browsing a bunch of website for which I did not subscribe to the RSS feed. Free. Safari. I spend at least half of my iPad usage time in Safari. Browsing the web with swiped and pinches is just incredible awesome and comfortable. You are living in the future. Mendeley. I am using Mendeley more and more, in particular since I have to use a PC. I don’t use too much the iPad app, though. I prefer Papers. Free. Simplenote. Almost perfect, really, in particular since tags were added. Perfect for taking notes during meetings, conference, or ideas on the fly. Free. Dropbox. Of course. How could you live without Dropbox, today ? Free of course. Not using it yet ? Do me a favor and use this link to register, and both of us will get an extra 250Mb for free. PLoS reader. Pretty good. Not many of papers of interest for me inPLoS, though. Free. ACS Mobile. Not very good actually. Nothing more than an RSS feed of the various ACS journals. Avoid it if you are using RSS already. $4,99, which is a shame considering it’s nothing more than a toc feed. Nature. Quite good, I like it so far. Free … except for the actual content, of course ! PubMed Tap. 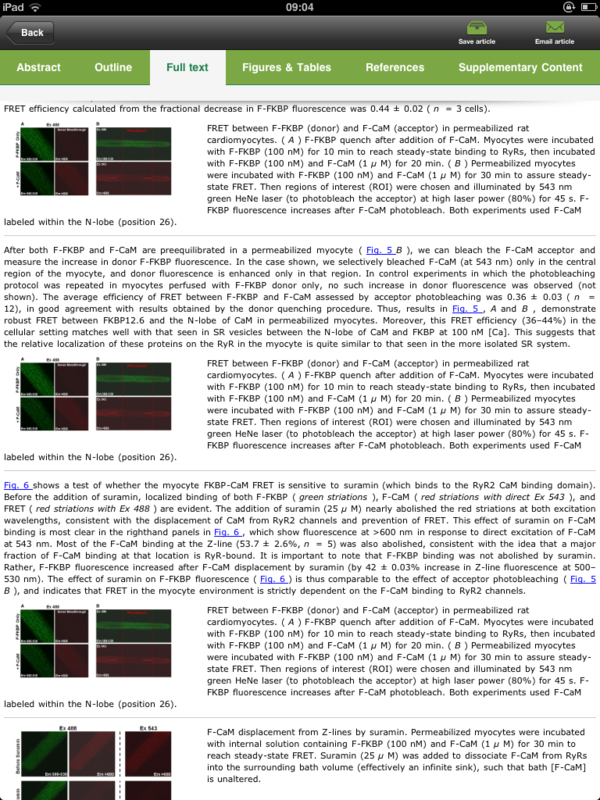 Quite good, but I don’t get many papers from PubMed. Free for the lite version. The platform is still young, and I miss a couple of apps, such as Scopus (a dedicated iPad app). The iPhone app is ok, though I does not sync to the Scopus profile, too bad. I am using it through the website, which is very usable on the iPad. I’d love to see a Sketchup app, too. A couple of apps I am not using, related to writing. This includes Papers, for instance. I don’t have a bluetooth keyboard, since I want to travel light. And extensive writing (hours long) without a keyboard is not comfortable. There are a couple of editors with or without syntax highlighting, such as Textastic, or TexTouch (with remote compiling), which would be useful when I’m writing TeX docs. What I like above all ? Not having to carry my portable transportable laptop anymore. I only take my iPad when I’m traveling for a couple of days or go to conferences. Incredibly comfortable.